Chapultepec Castle (Spanish: Castillo de Chapultepec) is located on top of Chapultepec Hill. The name Chapultepec stems from the Nahuatl word chapoltepēc which means "at the grasshopper's hill". The castle has such unparalleled views and terraces that historian James F. Elton wrote that they can't "be surpassed in beauty in any part of the world". It is located in the middle of Chapultepec Park in Mexico City at a height of 2,325 meters (7,628 ft) above sea level. The site of the hill was a sacred place for Aztecs, and the buildings atop it have served several purposes during its history, including that of Military Academy, Imperial residence, Presidential home, observatory, and presently, the National Museum of History. It is the only royal castle in the Americas. It was built at the time of the Viceroyalty as summer house for the viceroy. It was given various uses, from the gunpowder warehouse to the military academy in 1841. It became the official residence of Emperor Maximilian I and his consort Empress Carlota during the Second Mexican Empire (1864-1867). In 1882, President Manuel González declared it the official residence of the President. With few exceptions, all succeeding presidents lived there until 1939, when President Lázaro Cárdenas turned it into a museum. In 1785 Viceroy Bernardo de Gálvez ordered the construction of a stately home for himself at the highest point of Chapultepec Hill. Francisco Bambitelli, Lieutenant Colonel of the Spanish Army and engineer, drew up the blueprint and began the construction on August 16 of the same year. After Bambitelli's departure to Havana, Captain Manuel Agustín Mascaró took over the leadership of the project and during his tenure the works proceeded at a rapid pace. Mascaró was accused of building a fortress with the intent of rebelling against the Spanish Crown from there. Bernardo, the viceroy, died suddenly on November 8, 1786, fueling speculation that he was poisoned. No evidence has yet been found which supports this claim. Lacking a head engineer, the Spanish Crown ordered that the building be auctioned at a price equivalent to one-fifth of the quantity thus far spent thereon. After finding no buyers Viceroy Juan Vicente de Güemes Pacheco de Padilla y Horcasitas intended the building to house the General Archive of the Kingdom of the New Spain; that idea was not to prosper either despite already having the blueprints adapted for this purpose. Alexander von Humboldt visited the site in 1803 and condemned the sale of the palace’s windows by the Royal Treasury as a way of raising funds for the Crown. The building was finally bought in 1806 by the municipal government of Mexico City. Chapultepec Castle was abandoned during the Mexican War of Independence (1810–1821) and for many years later, until 1833. In that year the building was decreed to become the location of the Colegio Militar (Military Academy); as a sequence of several structural modifications had to be done, including the addition of the watchtower known as Caballero Alto ("Tall Knight"). On September 13, 1847, the Niños Héroes ("Hero Children") died defending the castle while it was taken by United States forces during the Battle of Chapultepec of the Mexican–American War. They are honored with a large mural on the ceiling above the main entrance to the castle. The United States Marine Corps honors the Battle of Chapultepec and the subsequent occupation of Mexico City through the first line of the "Marines' Hymn," From the Halls of Montezuma. Marine Corps tradition maintains that the red stripe worn on the trousers of officers and noncommissioned officers, and commonly known as the blood stripe commemorates the high number of Marine NCOs and officers killed storming the castle of Chapultepec in 1847. Several new rooms were built on the second floor of the palace during the tenure of President Miguel Miramón, who was also an alumnus of the Military Academy. The castle, now known as Castillo de Miravalle, started to acquire its current look during the Second Mexican Empire, when Emperor Maximilian I of Mexico and his wife Empress Carlota chose it as their residence and the seat of their Court in 1864. The Emperor hired several European and Mexican architects, among them Julius Hofmann, Carl Gangolf Kayser, Carlos Schaffer, Eleuterio Méndez and Ramón Cruz Arango, to design the several projects, which followed a neoclassical style and made the palace more habitable. European architects Kayser and Hofmann worked on several other revival castles, including Neuschwanstein Castle – built by Maximilian's Wittelsbach cousin Ludwig II of Bavaria twenty years after Chapultepec's renovation. Botanist Wilhelm Knechtel was in charge of creating the aerial garden located on the roof of the building. Additionally, the Emperor brought from Europe countless pieces of furniture, objets d'art and other fine household items that are exhibited to this day. At this time, the castle was still located on the outskirts of Mexico City. Maximilian ordered the construction of a straight boulevard (modeled after the great boulevards of Europe, such as Vienna's Ringstrasse and the Champs-Élysées in Paris), to connect the Imperial residence with the city centre, and named it Paseo de la Emperatriz ("Promenade of the Empress"). Following the reestablishment of the Republic in 1867 by President Benito Juárez and the end of the Reform War (Guerra de Reforma) the boulevard was renamed Paseo de la Reforma. The castle fell into disuse after the fall of the Second Mexican Empire in 1867. in 1876, a decree established it as an Astronomical, Meteorological and Magnetic Observatory on the site, which was opened in 1878. However, the observatory was only functional for five years until they decided to move it to the former residence of the Archbishop in Tacubaya. The reason was to allow the return of the Colegio Militar to the premises as well as transforming the building into the presidential residence. The palace underwent several structural changes from 1882 and during the presidency of Porfirio Díaz. The other Presidents who made the palace their official residence were Francisco I. Madero, Venustiano Carranza, Álvaro Obregón, Plutarco Elías Calles, Emilio Portes Gil, Pascual Ortiz Rubio and Abelardo Rodríguez. It was used for a time as an official guest house or residence for foreign dignitaries. 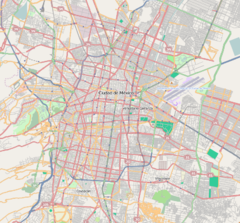 Finally on February 3, 1939, President Lázaro Cárdenas decreed a law establishing Chapultepec Castle as the seat of the National Museum of History (Museo Nacional de Historia) with the collections of the former National Museum of Archaeology, History and Ethnography, (now the National Museum of Cultures). The museum was opened on September 27, 1944. President Cárdenas moved the official Mexican presidential residence to Los Pinos, and never lived in Chapultepec Castle. In 1996, the castle was a film location for the Academy Award-nominated movie William Shakespeare's Romeo + Juliet starring Leonardo DiCaprio and Claire Danes. Many views of the castle as the Capulet Mansion can be seen throughout the film. In the 1954 American war film Vera Cruz starring Gary Cooper and Burt Lancaster, Chapultepec was portrayed using elaborate sets and decor. In the 2006 video game Ghost Recon: Advanced Warfighter, a level existed in and around the castle. Chapultepec Castle has been used as a model of castle architecture to design buildings such as the 13th Regiment Armory (Sumner Armory), in Bedford-Stuyvesant, Brooklyn, US. ^ Elton, James Frederick (26 July 1867). "With the French in Mexico". Hdl.handle.net. Retrieved 26 July 2018. ^ O’Connor, William (28 May 2018). "Chapultepec, the Mexican Castle That Drove a Belgian Princess to Madness and an Austrian Archduke to the Firing Squad". Thedailybeast.com. Retrieved 26 July 2018. ^ "Historia de Chapultepec". Museo Nacional de Historia. Archived from the original on 2009-11-14. Retrieved 2009-11-22. ^ ""The only royal castle in America"". Tripadvisor.com. March 28, 2007. Retrieved December 3, 2017. ^ "Mural of Cadet Jumping - Mexico501". Mexico501.com. ^ Hendel, archINFORM – Sascha. "Julius Hofmann". Eng.archinform.net. Wikimedia Commons has media related to Chapultepec Castle. Escuela Preparatoria Miguel Hidalgo "Carmen Serdán"
This page was last edited on 31 January 2019, at 18:26 (UTC).